What a month it has been here at the Hub. As it comes to an end, it’s time to look back and reflect how much impact did we make for our Movember Mission. A month started off really well with everyone putting in an effort to complete their challenge, especially the rowing machine challenge. Here we have Robb one of our Exercise Physiologists with one of his small group exercise classes. He is with Stephen (type 2 Diabetes), Geoff (cancer), Bob (cardiomyopathy) and Gordon (various musculoskeletal issues). We reached the initial target (300,000 metres) within 2 weeks, then we decided to increase it to 500,000 metres. Our staff was definitely pushed to get on there and catch up with our members. This is also an opportunity to raise awareness of men’s health and stop them from dying too young. Both Stephen and Graham have been working hard with our Physiotherapist Bek over a few sessions a week to improve their coordination, balance and gait! We decided to take this opportunity to introduce a few clients whom our team of exercise physiologists and physiotherapists have been working alongside and improving their chronic health conditions. He presented to the hospital 18 months ago with 15% heart function due to chronic heart failure. Since then Calisto has got his lifestyle back on track with the help of our exercise physiologists and dietitian. He has been coming into the hub 1-2 times a week for 12 months and as of 3 weeks ago his cardiologist informed him his heart function is now at 60%, putting him back in the ‘normal’ range! At the end of the month, we completed 475,715 metres in total (264,715 from members and 211,000 from staff). Despite not being the reach 500,000 metres, we’re glad that everyone put in their effort and get themselves moving. We asked our exercise physiologist, Paul Barlow and Physiotherapist, Bek Witcher to reflect on what they’ve seen during the month of Movember. What did you see during the month of Movember? raising of money to donate for Men’s Health. 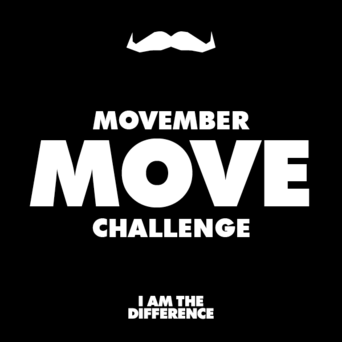 Bek: Movember was a great opportunity to drive people to move! It was a chance to practice what we preach to people each day. There has been some strong competition between the members and the staff here! Everyone has been passionate about achieving the goals that they set at the start of the month. We raised $105 in total. Although we weren’t able to reach our target ($500), we certainly achieved the goal of making everyone more active over the past month. Thank you everyone for donating and making Movember amazing. Remember that we hope to help ANYONE with chronic health conditions ANYTIME during the year. If you know anyone that can benefit from our service, please feel free to contact our lovely team at the Hub to organise a session with one of our Exercise Physiologists or Physiotherapists.